The United States Mint today officially released the design images for new 2009 quarters honoring the District of Columbia and the five United States territories. 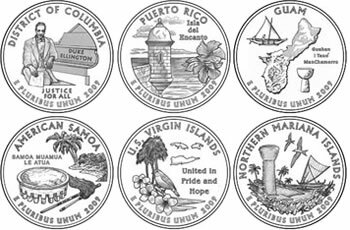 With a goal to assist in the selection of the most symbolic quarter design, dozens of quarter finalists were voted on earlier this year by residents in D.C., Guam, American Samoa, U.S. Virgin Islands, the Commonwealth of Puerto Rico and the Northern Mariana Islands. "Like the 50 State Quarters® Program before it, these new quarters will encourage Americans to appreciate the unique history of the District of Columbia and the territories of the United States," said United States Mint Director Ed Moy. "While we focus on each one’s individuality, we also recognize the common thread that unites us all." The six new quarters will enter circulating in approximately two-month intervals, with the D.C. quarter up first for a scheduled launch date of late January. 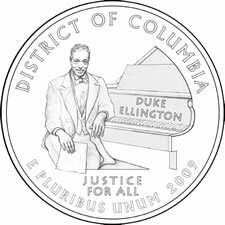 The coin’s reverse design features an image of celebrated musician Edward Kennedy “Duke” Ellington seated at a piano with the inscriptions, DUKE ELLINGTON and JUSTICE FOR ALL, the District’s official motto. The District of Columbia quarter reverse was designed by United States Mint Artistic Infusion Program (AIP) Master Designer Joel Iskowitz and sculpted by United States Mint Sculptor-Engraver Don Everhart. The second quarter depicts a sentry box in Old San Juan overlooking the sea with a hibiscus, Puerto Rico’s official flower. Isla del Encanto (Island of Enchantment) is also inscribed on the reverse. 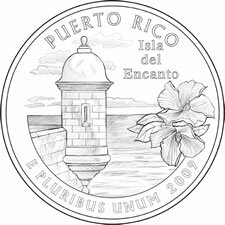 The Puerto Rico quarter reverse was designed and sculpted by United States Mint Sculptor-Engraver Joseph Menna. The third quarter of 2009, honoring the territory of Guam, includes an outline of the island of Guam, a latte stone-once used as building support in ancient Chamorro society-and a flying proa (a native boat). 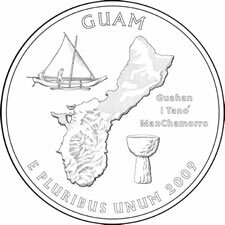 Guahan I Tanó ManChamorro (Guam, Land of the Chamorro) is also inscribed on the coin’s reverse. The Guam quarter reverse was designed by United States Mint AIP Associate Designer David Westwood and sculpted by United States Mint Sculptor-Engraver Jim Licaretz. The reverse design features the ava bowl, whisk and staff used in special Samoan ceremonies. 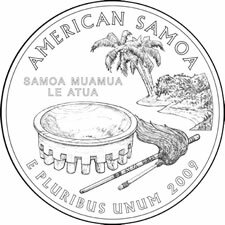 SAMOA MUAMUA LE ATUA (Samoa, God is First), the official motto of American Samoa, is inscribed on the reverse. The American Samoa quarter reverse was designed by United States Mint AIP Master Designer Stephen Clark and sculpted by United States Mint Sculptor-Engraver Charles Vickers. The reverse design features the three major islands that comprise the territory with a Banana Quit (the official bird), a Yellow Cedar (the official flower) and a Tyre Palm, a tree native to the United States Virgin Islands. United in Pride and Hope, the territory’s official motto, is also inscribed on the reverse. 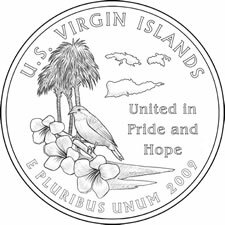 The United States Virgin Islands quarter reverse was designed and sculpted by United States Mint Sculptor-Engraver Joseph Menna. The reverse design features a latte stone on an island with a Carolinian canoe under sail in the lagoon. Two white Fairy Terns (native birds) are depicted in flight together overhead with a Carolinian Mwar (head lei) comprised of plumeria, langilang (ylang ylang), angagha (peacock flower) and teibwo (pacific basil), framing the design. 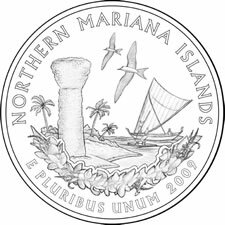 The Northern Mariana Islands quarter reverse was designed by United States Mint AIP Master Designer Richard Masters and sculpted by United States Mint Sculptor-Engraver Phebe Hemphill. Designs for each quarter were submitted and recommended through a process determined by the Governors for the District of Columbia and each United States territories. The U.S. Mint reviewed the designs before each Governor recommended a final design based mostly on a resident voting with some using a committee selection process. Both the Citizens Coinage Advisory Committee and the Commission of Fine Arts were involved in helping improve designs while the Department of the Treasury approved each. More information may be read though the US Mint page, The District of Columbia and United States Territories Quarter Program. The Mint’s announcement of the latest quarter designs is perhaps a final reminder of the conclusion of the 50 State Quarters® Program, which kicked off in 1999 and lasted ten years with more than 34 billion quarters issued. While not yet law, but expected to be within days with President Bush’s signature, a legislative bill authorizes a multi-year series of National Park quarters for each State, U.S. Territory and the District of Columbia to begin in 2010. Why havn’t the 2009 Washington D.C. mint mark P been released no bank in the Pittsburgh Pa. area have them.Is there a problem? When the 2009 Washington D.C.released.they should be release to every bank but I been ask so many bank and no one have it why? So far I only missing this one would you tell me wher can find it ? i think that the puerto rico and the guam quarters are really cool. i think it’s cool that they even HAVE quarters for those six places listed above. I have to say, that these coins that the mint has put out has made me thinking about studying about them. I am in the national GOB which is the national geography bee. Last year I got out becase they asked me what was on the back of the new South Dakota mint coin. I had no idea I realized that it was Mount Rushmore and there national bird. I have memorized them and I will be going to round 7 which I personally nevergot to I am very proud of it. Wow is great quarter to see it in Puerto Rico beautious design in there ideas. I was wondering if anybody has seen any flawed 2009 D.C. quarters that have a satin finish and should not go into circulation. I have one and I am stunned, I never thought I would come across something that should be of more superior mint than the regular quarters that are made for circulation. Can you please advise where I can purchase the 6 american territorial quarters – I need them to complete a set of quarters I have started. I need to know how much they cost because I need 7 of these sets. A reply from you would be greatly appreciated.